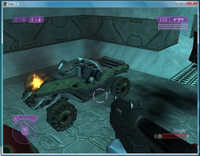 Description: This is a vehicle collection file to spawn a turretless warthog, aka the 'troop' warthog permutation. This is a vehicle collection file to spawn a turretless warthog, aka the 'troop' warthog permutation. The troop permutation was left in by Bungie, and is similar to the gauss permutation, except that there are no menu items in the gametype settings to spawn one, it has no turret (No, you can't get into the back where the turret was), and it was never used in the final game. This file spawns the warthog in the troop permutation just like how the warthog_guass.vehicle_collection file spawns it in the gauss permutation. This vehicle is really good for racing levels - it has no turret, so you can be sure an idiot won't use it to gun down others, and as I said, it goes a bit faster.